Add social media sharing buttons to each product page by linking your store's social settings. Before getting started, make sure you are logged in as an operator and click the Social Settings icon in the Dashboard sidebar. Click the Facebook toggle button. Register your app at Facebook for Developers to get your App ID and Secret. Enter your App ID and App Secret. Click Save Changes. Enabling this setting adds a Facebook icon and link to share that product on the product page. Click the Twitter toggle button. Enter your Twitter username and link to your profile page. Click Save Changes. Enabling this setting adds a Twitter icon and link to share that product on the product page with your shop's Twitter handle in the message. Click the Pinterest toggle button. Enter your Pinterest profile page. Click Save Changes. Enabling this setting adds a Pinterest icon and link to share that product on the product page. Click the Google+ toggle button. Enter your Google+ profile page. Click Save Changes. 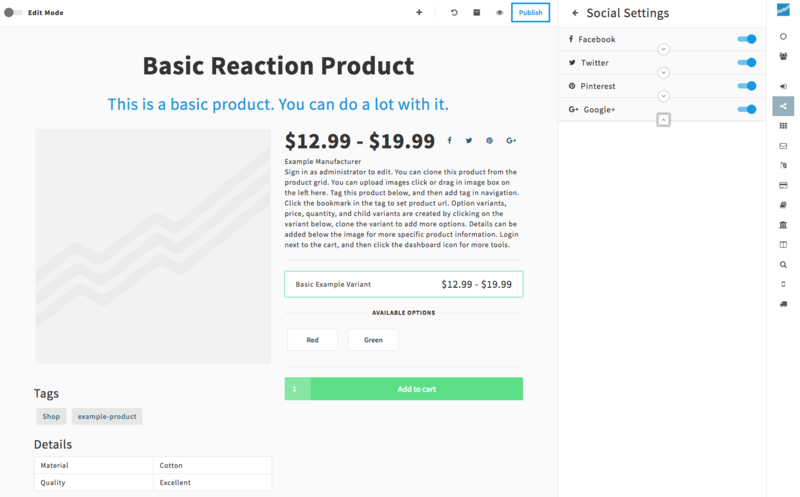 Enabling this setting adds a Google+ icon and link to share that product on the product page.